In the ninth century b.c., the Phoenician princess Jezebel orders the execution of all the prophets who refuse to worship the pagan god Baal. Commanded by an angel of God to flee Israel, Elijah seeks safety in the land of Zarephath, where he unexpectedly finds true love with a young widow. But this newfound rapture is to be cut short, and Elijah sees all of his hopes and dreams irrevocably erased as he is swept into a whirlwind of events that threatens his very existence. 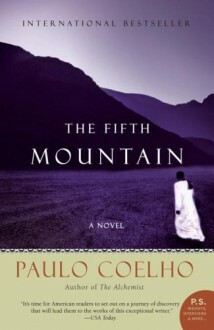 Written with the same masterful prose and clarity of vision that made The Alchemist an international phenomenon, The Fifth Mountain is a quietly moving account of a man touched by the hand of God who must triumph over his frustrations in a soul-shattering trial of faith.